Veg Momos, a steamed or fried dumpling stuffed with mixed vegetables, is a delicious snack food enjoyed in Tibet region. From last few years, Momos are getting very popular in other parts of India and you can easily prepare them at home by either steaming or deep frying. The traditional recipe requires it to slow-cook by steaming and this recipe uses this technique to keep them healthier and authentic. Steps to cook Vegetarian Momos at home can be classified in three parts; 1) prepare fresh vegetable stuffing, 2) bind the dough, fill rolled dough with mixed vegetable mixture and give them a “Potli” shape, and 3) Steam cook them. This Veg Momos recipe explains all three parts with step by step photos and also explains how to give them its unique pleated bag shape. Enjoy them with spicy red tomato chilli chutney. Finely cut all vegetables as mentioned in the ingredients section. 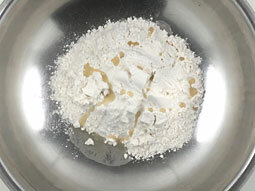 Add 3/4 cup maida (all purpose flour), 1 teaspoon oil and salt in a large bowl. 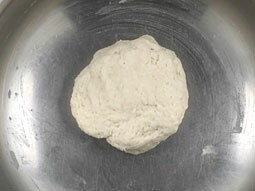 Mix all ingredients well and prepare a soft pliable dough (like paratha dough) by adding water as needed. Cover the dough and keep it aside for 20-25 minutes. Heat 1 tablespoon oil in a pan over medium flame. Add finely chopped ginger and garlic and sauté for 30 seconds. 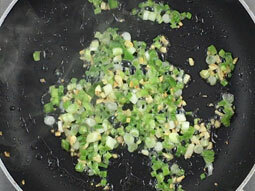 Add green onion and sauté for a minute. 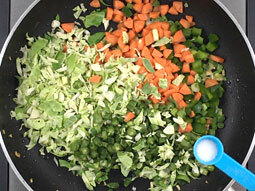 Add all chopped veggies (carrot, cabbage, capsicum and green beans) and salt. Mix well and sauté them for 4-5 minutes. Add 1 teaspoon chilli sauce. Add 1/2 -1 teaspoon soy sauce. Add 1/2 teaspoon black pepper powder. 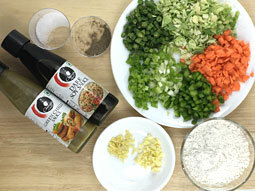 Mix well and sauté for a minute. Turn off the flame. 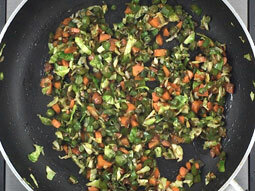 Stuffing for Veg Momos is ready. 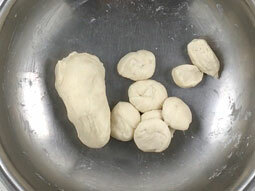 Knead the dough again for a minute and divide it into 2-equal portions. Give each portion a round cylindrical shape like cucumber. 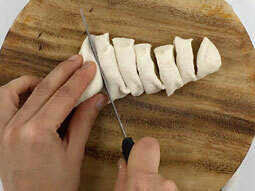 Cut each one into 6-7 equal portions with a knife as shown in the photo. Give each small portion a round shape like ball and flatten it a little into pattie by pressing it in between your palms. Cover them with a wet cloth or a plate to prevent them from drying. 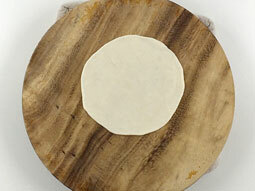 Place one dough pattie on a rolling board and roll it out into a thin disc (approx. 4-5 inch diameter). Roll it from sides and keep the center portion little thick compared to sides. If required, sprinkle some dry flour while rolling. Place approx. 1 tablespoon filling in the center. Don’t over-stuff it, otherwise it will be difficult to get a proper “potli” shape. Lift the edge from one side and start pleating (fold the edge a little inside and then little outside alternatively). Join them in the center to seal it. 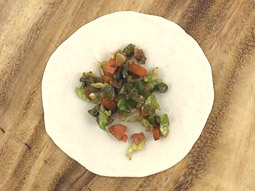 Prepare momos from remaining dough patties in a similar way. 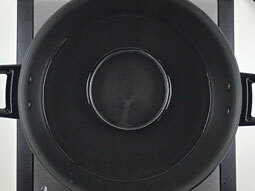 Grease a steamer plate or any other plate (it should easily fit into the steamer or a deep vessel) with oil to prevent them sticking. 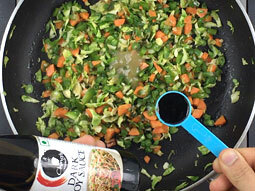 You can also line a plate with cabbage leaf instead of greasing the surface with oil. Arrange Veg Momos on a plate in a way that there is some space around them to expand. 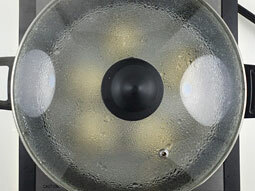 Heat 1-2 glass of water in a steamer or a deep vessel over medium flame. Place stand in the steamer and place momos plate over it. Momos should not touch the water. Cover the steamer/vessel with a lid and steam them for 6-7 minutes over medium flame or until they look little translucent and shiny. Remove the lid and check them by touching it. If they don’t feel sticky then it means they are cooked. Transfer them to a serving plate. 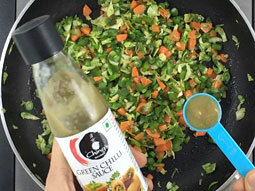 Serve hot Veg Momos with Momos Chutney or Schezwan Sauce. You can choose any vegetable to make the stuffing. 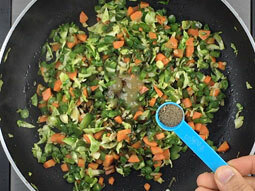 Add button mushroom along with other veggies used in this recipe for variation. 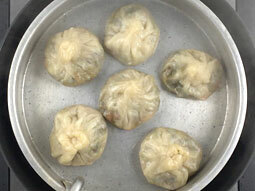 Enjoy momos while they are hot since its outer layer starts to turn hard/rubbery as it cools. 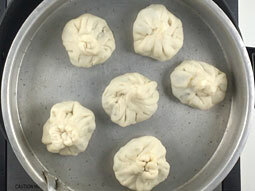 You can also use pressure cooker instead of steamer to steam the momos in a same way as described above. However, if you are using pressure cooker, don’t use the whistle while steaming the momos. You can also use bamboo steamer to steam cook them. Make sure that the water does not come in contact with the momos while steaming. Deep fry steamed momos for a crispy outer layer. 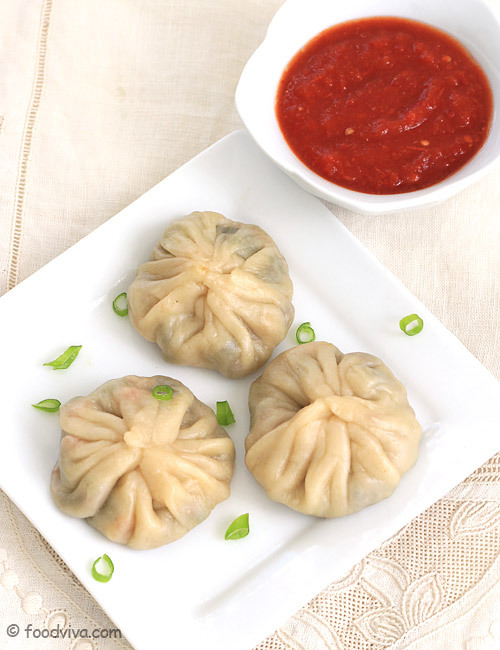 Serving Ideas: Serve vegetable momos with hot tomato chilli chutney or schezvan sauce as afternoon snack. Wow recipe..very impressive way of teaching..keep it up.. It was awesome. It really really really tasted heavenly. The veggies in it were totally exotic. I loved it a lot. Thanks a million times. Tried the monos today. They turned out very well. Could you also give recipe of momo chutney. Response: Gald to haer that moms turned out well. 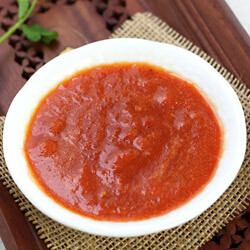 We will post the momo chutney recipe in next 1-2 days.